We all want what’s best for our pets, but the best way to help our kittens stay healthy is to feed them the right food. Dry kitten food research can take up lots of time, so we decided to compile a list of the best dry kitten foods to save you time while bringing you quality kibble for your furry family member. If you’re interested in giving your kitten the very best, look no further than this buying guide. No more meowing around, let’s get started! Choosing a new kitten food can be tricky, but your choice is made easier when you know what to look for. We found 6 features that are important to consider before purchasing your next bag of kitten food. To find the best kitten food for your cat, look for these qualities. Flavor: Like human foods, there are several flavors of kitten foods on the market. The most common flavor for kitten food is chicken, but there are other flavors that include fish, duck, or turkey. Package Size: Package size determines how much kitten food comes in every bag. If your kitten is new to eating kibble style food, try out a smaller bag before buying a large bag to ensure they love the flavor and texture. Recommended Ages: Kitten food is meant for kittens old enough to eat solid foods all the way up to one year. Some kitten foods are not ideal for your cat until they reach a few months old, so be sure to read the fine print before buying a food that may not be suitable for them. Type: Some kitten foods come in both wet and dry options, but there are also different kinds of kibble. The most common kibble option comes in a crunchy texture, but there are a few brands that offer softer kibble bites that are easier to chew. Bag Dimensions: Knowing the bag dimensions helps you determine where to store the bag or food in your home. If you have a separate container to store the food away, knowing the bag dimensions will help you figure out if all the food will fit in your container. Grain Free: Grain-free kitten food options are great for cats who are allergic to grains like wheat. Many brands offer grain-free kitten foods in a separate line of food if you love one brand but can’t seem to find a grain-free option in our list. Now that you know what features matter when picking out new kitten food, it’s time to find the best food for your kitten! We’ve hand-selected 10 of the best dry kitten foods to give you several options to choose from. Our top pick and budget pick are the two very best kitten foods on our list, but we also included several other options for picky eaters. If you’re ready to make feeding time a breeze, it’s time to dive into our list of the 10 best kitten foods. Royal Canin pet foods have always been curated and created with your pets in mind. Whether it’s a breed or age specific food, Royal Canin does their due diligence to give your cat the best of the very best. 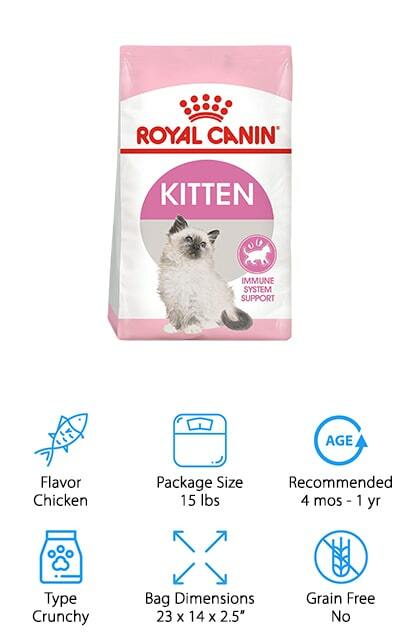 Royal Canin’s Kitten Food was made for kittens ages 4 months to 1 year to support their developing immune system as they make their way from kitten to adult cat. With an exclusive blend of antioxidants and vitamins, you’ll know that your kitten is getting everything they need to grow healthy and strong. Your kitten will be able to easily digest every ingredient as this formula was created to give them maximum nutrition while they grow. Each mineral, vitamin, and protein is made to give your kitten energy at each stage of their kittenhood. With a small texture, your cat will be able to chew this kibble easily without fear of hurting their newly grown teeth, too. If you want the best dry kitten food for sale on the market, Royal Canin is a great choice. 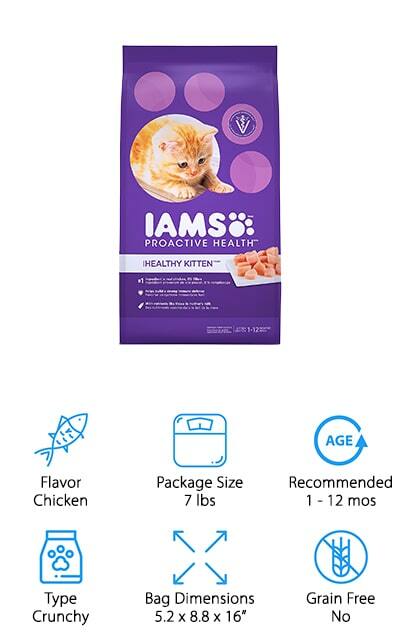 IAMS Proactive Health Kitten Food provides you everything you need to raise a healthy, happy kitten at a great price. Small kibbles make it easy for your kitten to chew and digest every nutrient they receive from their IAMS food. Chicken is the number one ingredient, so your kitten will grow lean and strong instead of overweight and lazy. Nutrients included in this food are a lot like a mother’s milk. You’ll find Vitamin E inside every bite to help build a strong immune system. Omega-3 DHAs help promote your kitten’s brain development as they grow to adulthood. You’ll also find Taurine inside the formula to help keep your kitten’s eyes and vision healthy. If you’re unsure about what kitten food to give your cat, but don’t want to break the budget trying out different foods, IAMS Proactive Health Kitten Food is a great option that allows you to buy a smaller bag at a great low price. Grab a bag and see for yourself! Hill’s Science Diet has been backed by science since the 1960s. Their dry kitten food blend was created with weaning to 1-year-old kittens in mind to deliver the nutrients, energy, and vitamins that they need. This food provides a natural DHA to ensure your kitten’s eyes and brain continue to develop as they grow. A combination of antioxidants works to create a strong immune system internally to keep all the nasty bacteria and infection away. Every ingredient is natural and easy to digest for easy pickup as your kitten eats. You’ll never find any preservatives, artificial colors, or flavors inside the bag either. This formula is also great for nursing or pregnant mothers who need to deliver maximum nutrition to their growing babies. If you want your kitten to develop in the healthiest way, Hill’s Science Diet Dry Kitten Food is clinically proven to stimulate the growth of your cat. If you want a diet that is based on the facts, go with Hill’s Science Diet! Blue Buffalo prides themselves on having every bag’s first ingredient be real meat. In this particular kitten food, the meat ingredient comes from deboned chicken, chicken meal, fish meal, and egg, so you’ll never have to worry about your kitten getting enough protein. You’ll also find garden vegetables and fruits, as well as wholesome grains, too. DHA and ARA are fatty acids that are in a mother’s milk and can be found in this recipe to ensure your kitty’s eyes and brain development as they grow. 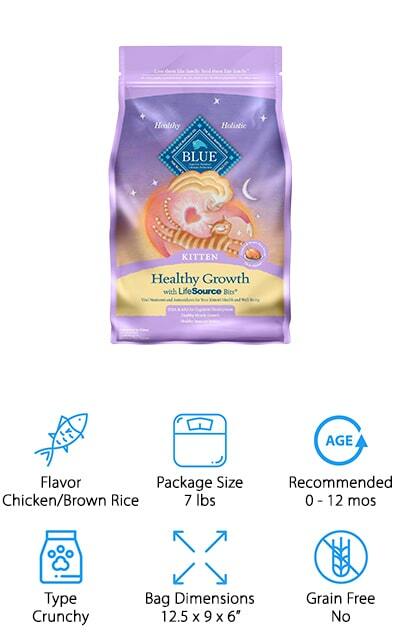 Blue Buffalo considers this kitten food to be holistic, so the only enhancement made to the ingredients will be the extra vitamins and minerals added in every bite. These minerals and vitamins are curated by holistic veterinarians to help support and develop the immune system at every life stage. You’ll never find any chicken by-products meals, corn, wheat, soy, artificial flavors, or preservatives either. If you want a more natural approach to feeding your kitten, go with Blue Buffalo! Purina ONE’s Dry Kitten Food is another great alternative for pet parents searching for no artificial flavors or preservatives. 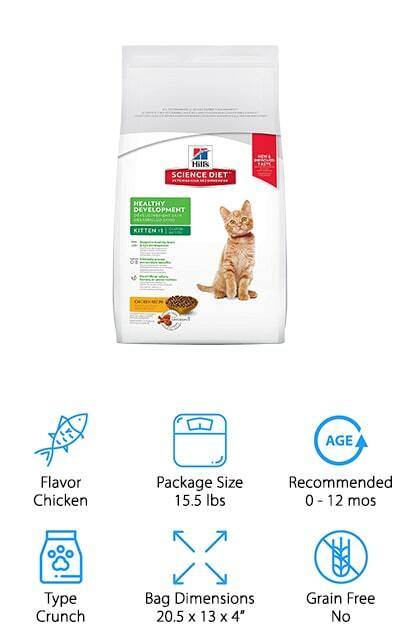 With chicken being the number one ingredient in every bag, you’ll never have to wonder if your kitten is getting enough protein or where it comes from. Each bag has high enough protein to develop and support strong muscles as your kitten grows into their next phase of life. There are no fillers in this recipe, which means that every ingredient has a purpose to help your kitten stay healthy, strong, and happy. Purina ONE ensures that every bag is 100% balanced to give your cat everything they need to thrive every time they sit down for a meal. 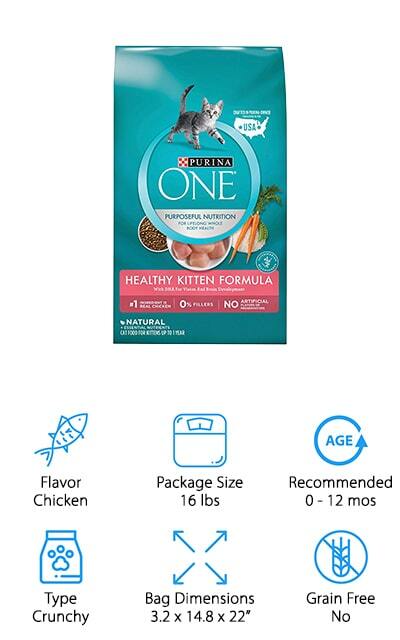 For cat parents who want their kitten to live a long and healthy life, Purina ONE has been trusted for years to deliver nutrition that gives them everything they need to keep purring for years to come. Merrick’s Purrfect Bistro Kitten Food is the first grain-free option on our list for kittens who may have allergies to grains. This 7-pound bag features Omega fatty acids to keep the skin and fur shining. The vitamins and minerals in this recipe give your kitten the energy it needs throughout the day, while the antioxidants and probiotics support their immune system. Each bag is formulated with grain-free and gluten-free ingredients. You’ll never find any preservatives or artificial flavors or colors either. Every bag is cooked in the USA, so you’ll know that every ingredient passes the test. Merrick recommends giving both wet and dry versions of this food to your kitten as they grow to ensure they get enough moisture. 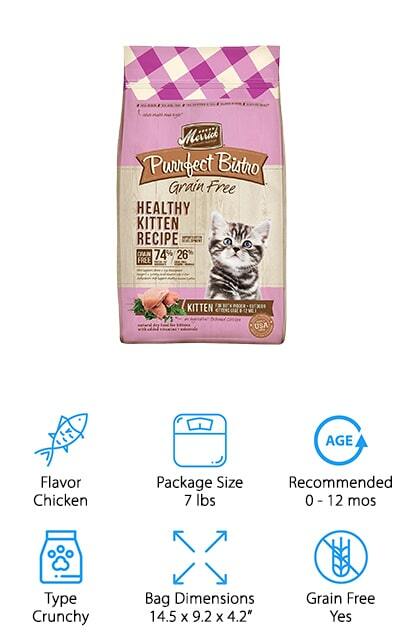 Merrick prides themselves on bringing real whole foods together with vitamins and minerals in one bag to ensure the life and longevity of your kitten. For picky eaters or kittens with allergies, try Merrick’s Purrfect Bistro Kitten Food! Wellness CORE has always been about giving your pet the highest protein they can in every bag. 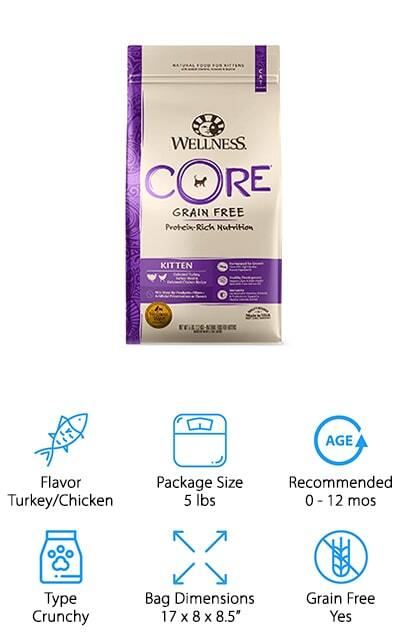 Wellness CORE’s Dry Kitten Food is naturally grain-free, as well as complete and balanced for everyday nutrition and health. Rich in protein, with both turkey and chicken, your kitten will crave more every time they sit down at their bowl. Inside each bag, you’ll find enough calories to give your kitten energy, as well as DHAs that are needed for healthy development. With premium and natural ingredients, you’ll never have to guess if your cat is getting the best. You’ll never find any soy, wheat, corn, meat by-products, artificial colors, flavors, or preservatives in any bag. Each kibble is made and cooked in the USA, so each ingredient will pass the test with flying colors. Your kitten will have everything they need to succeed with Wellness CORE’s Dry Kitten Food. Try a bag and see for yourself! Nutro MAX Dry Kitten Food includes several ingredients to continue the development of your kitten as they grow to an adult. Antioxidants and ingredients like cranberries are helpful in keeping your kitten’s immune system up and running. You’ll also find taurine ensure that your kitten’s eyes stay sharp and their heart pumping. Vitamins E and C will be there to keep your cat’s skin and fur healthy, too. The number one ingredient in this bag is chicken meal, so you’ll never find any by-products like chicken intestines, feet, or heads included in this recipe. Omega fatty acids, including fish oil, sunflower oil, and soybean oil, will keep your pet’s coat shiny. Nutro MAX also offers a wet kitten food of this recipe to give your cat extra moisture as they move from kitten to adulthood. With all the ingredients your kitten needs, you’ll love that Nutro MAX Dry Kitten Food gives your cat the most energy and health while they grow. Kittens need a lot of protein while they grow and that’s where Purina Pro Plan FOCUS Kitten Food comes in. With 41% protein, your kitten will grow up to be lean, healthy, and strong. Real chicken is the number one ingredient in this recipe. With DHA, each kibble gives your kitten’s brain and eyes nourishment. 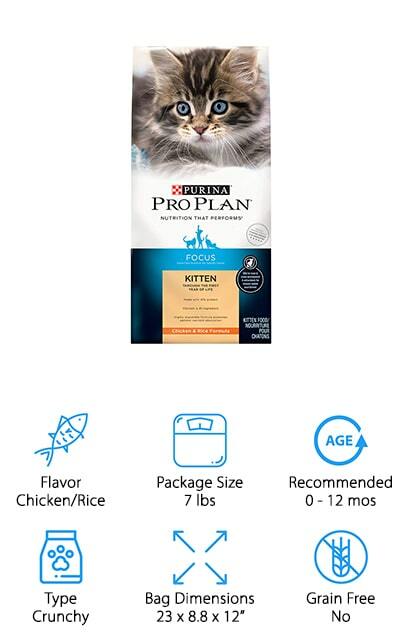 The Focus line of Purina Pro Plan foods is made exactly for your kitten to deliver the most nutrition and nourishment as they move from kitten to adulthood. Minerals like calcium and phosphorus help build strong bones and teeth, which is very important for a growing cat as they learn to jump and chew. As your kitten grows, you will have to adjust how much of this food you feed them as it is high in calories. This recipe is 100% balanced and complete to ensure both you and your kitten feel good about what they eat. If you’re looking for a high-protein, high-calorie food, Purina Pro Plan FOCUS Kitten Food is the perfect option for you and your kitten. For a kitten formula with a variety of flavors, you won’t have to look any further than the Natural Balance Dry Kitten Formula. 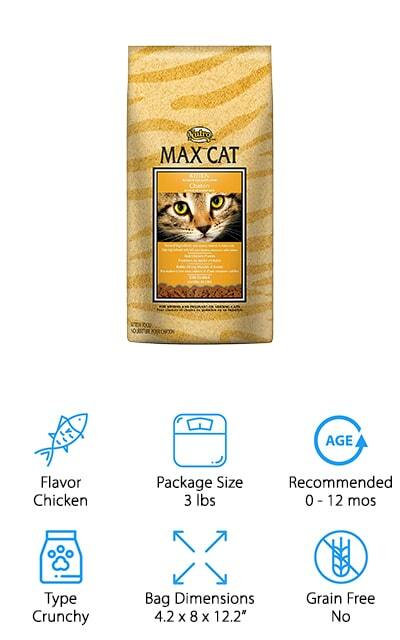 Made with chicken, duck, and salmon, your cat can enjoy the benefit of several high protein ingredients with different natural flavors. Natural Balance takes a whole body approach when making new formulas, which means you can feel comfortable with knowing they took every part of the body into consideration when making this recipe. Each kibble is made into special, small shapes to ensure that your kitten can easily chew and eat the food without any difficulty. This particular recipe is gluten-free and includes adequate DHA and EPA to keep your kitten going every day. With several proteins, minerals, fatty acids, and antioxidants, your kitten’s heart, eyes, teeth, and bones will be supported and developed as they make their way to adulthood. 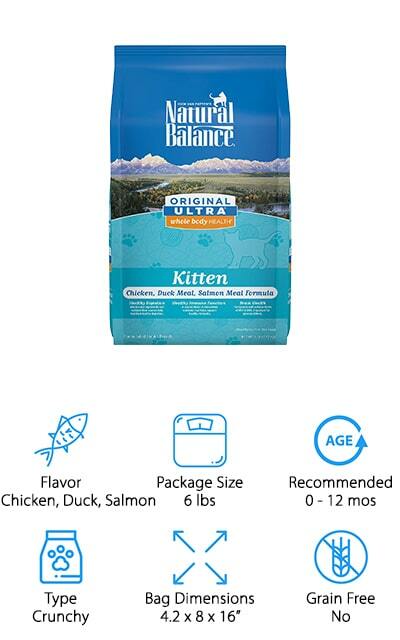 With a naturally balanced food that keeps your kitten’s entire body in mind, Natural Balance Dry Kitten Formula is an excellent choice for pet parents.